As of March 2014 there were an estimated 948 million 50p coins in circulation. In 1967 the Deputy Master of the Royal Mint approached the Decimal Currency Board to ask for their advice on the introduction of a new coin. The 10 shilling note then in use was lasting only five months and it had been suggested that a coin, which could last fifty years, would be more economical. The problem with this was that all coins are arranged in "tiers", each coin in a tier having the same weight-to-value ratio so that a bag of mixed coins could be weighed to ascertain the value so long as they were all bronze, all silver, etc. Each coin was identified within its tier by its size and each tier had to be capable of being identified by sight and touch. This was achieved in the then existing sets by the use of different materials ("bronze", "brass" and "silver") with the bronze coins having plain rims, the nickel-brass threepenny bit being 12-sided and the silver coins having milled rims. If the 10-shilling coin was to be made in the same tier as the silver coins it would have to be twice the weight of the Crown (then and now only in use for commemorative pieces) and it was generally agreed that that would make it very unpopular and expensive. It would therefore have to be in a new tier of its own. The Mint could not find a suitable metal which was sufficiently different in colour to the existing coins and which would not tarnish. This last point was thought to be important because the new coin would be the most valuable coin in general circulation in the world (about £8.40 in today's values). It therefore had to be a different shape; various methods had been used overseas to overcome this problem but none were without drawbacks. 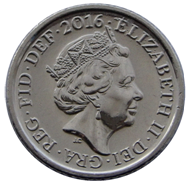 A hole through the coin did unacceptable things to the Queen's head (which is a legal requirement on British coins), and wavy-edged, flat-edged or square coins could not be used in the coin-handling machinery which was then coming into increasing use in industry, banking and vending. To be used in a vending or sorting machine a coin would have to roll under gravity and be capable of being measured without being presented in a special way, in other words it needed a constant breadth at whichever angle it was measured. The Technical Member (and the only engineer) on the Decimal Currency Board was Hugh Conway, at that time President of the Institution of Mechanical Engineers and Managing Director of Bristol Siddeley Engines, Bristol. He had found in a mathematical textbook a formula for a non-circular shape of constant breadth and asked the design office at Patchway, near Bristol, which normally worked on the engines for aircraft such as Concorde, Vulcan and Harrier to draw out the shape. However, this turned out to be a wavy-edged form with re-entrant sides which would not roll and which could not be measured easily. A designer, Colin Lewis, suggested a much simpler shape which in its basic form is an equilateral triangle with a small circle centred on each apex and with a larger circular arc centred on each apex but tangential to each of the two opposite small circles. Wherever it was measured, the breadth of this shape was one small radius plus one large radius. (The small radius was not strictly necessary to the geometry, but made the shape more practical by removing inconvenient sharp points and reducing the rate of wear, and therefore change of size, in handling). The number of corners could be any odd number greater than one. A drawing was made to illustrate the proposal which was accepted by Hugh Conway. He chose seven sides as a compromise between too radical a shape, which might not be acceptable to the public, and having too many sides, which would make a shape visually difficult to differentiate from a circle. The shape was drawn out by Dave Brown and samples made from stainless steel by the Model Shop, together with a section of perspex channel with a bend to demonstrate that the "coin" would roll around corners and drop through gauging slots. The legend "50" was photo-etched (from a master drawn by Ray Gooding) on the faces of the samples since it had already been decided that the new coin would be the first coin of the new Decimal series. When the Decimal Currency Board met none of the other members had any suggestion to make, so when the samples were produced the idea was accepted without opposition. 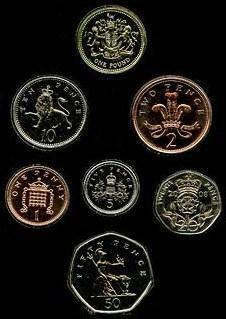 The shape of the original 50p coin has been copied all over the world (with 3, 7, 9 and 11 sides) and the new 20p coin was made in the same shape when it was introduced in 1982. The original reverse of the coin, designed by Christopher Ironside, and used from 1969 to 2008, is a seated Britannia alongside a lion, holding an olive branch in her left hand and a trident in her right, accompanied by either NEW PENCE (1969–1981) or FIFTY PENCE (1982–2008) above Britannia, with the numeral 50 underneath the seated figure. To date, three different obverses have been used. In all cases, the inscription is ELIZABETH II D.G.REG.F.D. 2013, where 2013 is replaced by the year of minting; the Benjamin Britten coin (2013) additionally has the denomination, FIFTY PENCE, on the obverse, before the year (as the commemorative obverse omits the denomination entirely). In 1997 the 50p coin was reduced in both diameter and thickness and the older coins were removed from circulation. The new coin was introduced on 1 September 1997. The old larger coin was withdrawn on 28 February 1998. The design remained unchanged. From 1998 to 2015 the portrait by Ian Rank-Broadley has been used, again featuring the tiara, with a signature-mark IRB below the portrait. In 2008 the obverse design was rotated slightly, to match the new reverse design which is displayed with the heptagon point down rather than point up. In August 2005 the Royal Mint launched a competition to find new reverse designs for all circulating coins apart from the £2 coin. The winner, announced in April 2008, was Matthew Dent, whose designs were gradually introduced into the circulating British coinage from mid-2008. The designs for the 1p, 2p, 5p, 10p, 20p and 50p coins depict sections of the Royal Shield that form the whole shield when placed together. The shield in its entirety is featured on the £1 coin. The 50p coin depicts the lowest point of the Royal Shield, with the words FIFTY PENCE below the point of the shield. The coin's obverse remains unchanged. It should be noted that this coin is an example of a shape of constant width. Shapes of constant width are shapes that have constant width but are not circular. In addition to the standard designs there have been several variant reverse designs used on the 50p coin to commemorate important events. These are summarised in the table below. There are also 29 different variants not listed here which were minted in 2011 in celebration of the 2012 Summer Olympics. ^ "The 100th Anniversary of the Birth of Benjamin Britten 2013 UK 50p Coin". The Royal Mint. Retrieved 21 May 2014. ^ "Old-style 50p pieces withdrawn". BBC. 27 February 1998. Retrieved 30 September 2017. ^ "Royal Mint unveils new UK coins". 2 April 2008. Archived from the original on 18 January 2010. ^ Mathematical Explorations with MATLAB at Google Books. Retrieved 31 January 2014. ^ "Fifty Pence Coin". Royal Mint. Retrieved 7 December 2016. ^ McRae, Mike (13 March 2019). "UK Put a Black Hole on a 50p Coin to Honour Stephen Hawking, And It Looks Stunning". ScienceAlert.com. Retrieved 13 March 2019. ^ London 2012 coin designs and specifications, Royal Mint. Retrieved 2014-05-08. ^ "Fifty Pence 1969-1997 Large Sized". Check Your Change. Retrieved 6 August 2017.